Several Boston student environmental organizations have unified under the #PutAPriceOnIt campaign in an effort to lobby against carbon pollution. The coalition includes Tufts Climate Action, Emerson Eco-Reps, Fossil Free MIT, DivestNU and the Boston University Environmental Student Organization. 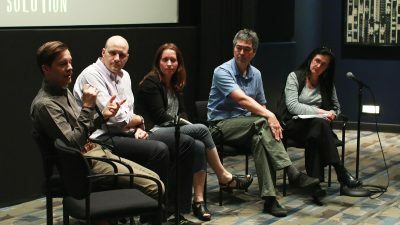 The organizations hosted a screening Wednesday night of “Priceless,” an episode from season two of “Years of Living Dangerously,” a TV and internet project run by National Geographic, which focuses on solutions to climate change. The #PutAPriceOnIt campaign is sponsored by Our Climate, a national organization of students, said Page Atcheson, executive director of Our Climate. Students who are involved work to mobilize their campuses against climate change and encourage their college and university presidents to endorse the project. Atcheson said the #PutAPriceOnIt campaign fights for a price to be put on carbon emission. For instance, one way the campaign aims to do this is by charging companies a fee for each ton of carbon emitted. Carrie Cullen, a sophomore at Emerson College, an eco-rep at the Emerson College Office of Sustainability who helped organize the screening, said climate change is the biggest problem the millennial generation has to deal with. “Yearly rates of carbon dioxide in the atmosphere have been steadily increasing since the Industrial Revolution and have reached alarmingly high levels in recent years as carbon pollution and industries grow,” Cullen said. Cullen said it is crucial for college students to be educated on prominent environmental issues facing their generation. Elizabeth Ventura, a junior at Northeastern University and an organizer for DivestNU, said the greatest problem surrounding climate change is a lack of public education. Elizabeth Hannigan, a junior in the College of Arts and Sciences at BU and the president of BU’s ESO, said climate change is a major issue facing individuals living in coastal regions, especially for those who may not have the resources to cope with climate change. “I feel as though it is our country’s duty to reduce our emissions so that we can stop negatively impacting other smaller countries and societies who should not have to suffer the consequences of fossil fuels that they did not emit,” Hannigan said. Brian Helmuth, an environmental policy professor at Northeastern, said grassroots campaigns like #PutAPriceOnIt are helpful, but society cannot rely on legislation to reverse the effects of climate change. Robyn Hannigan, founding dean of the School of Environment at the University of Massachusetts Boston, said she thinks #PutAPriceOnIt has been successful with students because it is easy to understand.